George Wagner IV enters a Pike County Courtroom Wednesday morning surrounded by local law enforcement. PIKE COUNTY — Despite the arguments of his court-appointed, Portsmouth-based attorney Rick Nash, Pike County Court of Common Pleas Judge Randy Deering very quickly denied bail to George Washington Wagner IV during his arraignment Wednesday morning. Wagner was the second of the four main suspects in the infamous Rhoden murder case to go before Deering. Including Wagner, each of the four suspects are charged with eight counts of aggravated murder, one count for each victim in the Rhoden massacre. Each murder count carries with it four death penalty specifications. Joined at the defense table by co-counsel Charles Knight, Nash argued Wagner cooperated with police throughout the extensive investigation leading up to the indictments issued earlier this month against the suspect and his family, brother Edward “Jake” Wagner and parents George Washington “Billy” Wagner III and mother Angela Wagner. “This was not a quick investigation,” Nash noted, adding George Wagner IV had no previous criminal history notably including no history of violent crimes. Speaking for the prosecution, Angie Canepa, a special prosecutor assigned to the case by the Ohio Attorney General’s office, said Ohio law specifically allows for denial of bail in capital cases and noted the defendant faces eight capital charges as well as an extensive list of additional felony counts. Canepa further stated George Wagner IV took part in an alleged meeting between the various suspects in the case prior to their arrest. At that meeting, she said, the suspects made plans for taking revenge against certain persons if in fact they were arrested but managed to make bail. Alleged threats were specifically made against Pike County Sheriff Charlie Reader, Ohio Attorney General and Governor-elect Mike DeWine and a special agent working on the case. After hearing arguments from both sides, Deering did not noticeably hesitate before denying bail. All in all, George Wagner IV faces 22 counts, including the eight counts of aggravated murder. The other counts include four counts of aggravated burglary, as the prosecution contends the suspects broke into the homes of the Rhodens in order to commit the murders. Other charges include forgery (relating to child custody documents), conspiracy and engaging in a pattern of corrupt activity. All four of the main Rhoden murder suspects face the same charges. Arraigned Tuesday, Edward Wagner faces one additional charge of sexual contact with a minor, namely one of the victims, Hanna May Rhoden. DeWine has said a custody battle over their daughter, Sophia Wagner, now 5, is at the heart of the motive for the massacre. As he did during Jake Wagner’s arraignment the day before, Deering took the time to read the entire indictment against George Wagner IV. The conspiracy charge specifically alleges numerous actions were taken by the Wagners in preparation for the murders. Those actions include, among others, the purchase of specific shoes, as well as “brass catchers,” ammunition, a magazine clip, parts to build a silencer or silencers and tampering with evidence including but not limited to a video recording device the indictments charge Edward Wagner purchased in March 2016. The Rhoden murders took place in April 2016. Like his brother the day before, George Wagner IV pleaded not guilty to all charges and specifications. He will spend the holidays in jail but will be back in court for a pretrial hearing Jan. 9. Also like his brother, George Wagner IV waived his right to a speedy trial through July 31, 2019. Deering again approved a gag order preventing all officials connected with the case from commenting to the media. Arraignment dates have been set for the remaining two murder suspects in the Rhoden case. Angela Wagner, 48, will be in court 1:30 p.m. Friday. Extradited from where he was arrested in Kentucky, family patriarch George “Billy” Wagner III, will come before Deering 1:30 p.m., Dec. 3. Prior to the issuance of the gag order, Billy Wagner’s attorney publicly stated he will likely seek a change of venue for his client, moving the case outside of Pike County. Two other, non-murder suspects in the Rhoden case were arraigned Nov. 14 and are in fact out on bail, though each are also under electronically monitored house arrest and barred from any contact with the families of the victims. Grandmothers in the Wagner family, Fredericka Wagner, 76, and Rita Newcomb, 65, both pleaded not guilty during their arraignments. Both face felony charges of obstructing justice and perjury. The latter charges stem from false testimony the two allegedly presented in July to a Pike County grand jury investigating the murders. Newcomb also faces forgery charges. Fredericka Wagner is the elder George Wagner’s mother. Newcomb is the mother of Angela Wagner. 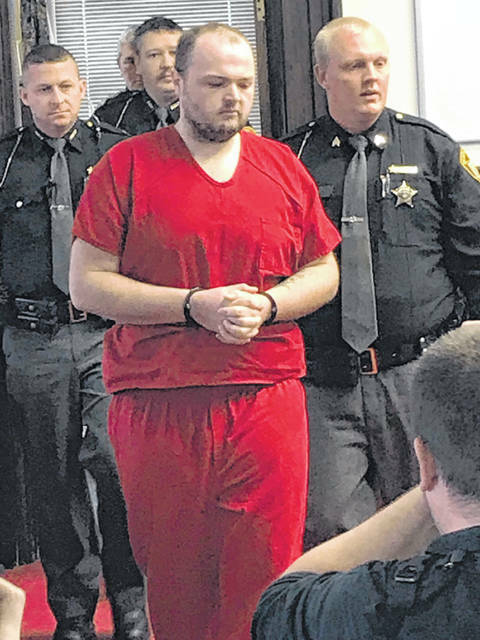 https://www.recordherald.com/wp-content/uploads/sites/27/2018/11/web1_Wagner-IV.jpgGeorge Wagner IV enters a Pike County Courtroom Wednesday morning surrounded by local law enforcement.